If you use PowerShell at all and you haven’t at least tried out PowerGUI, you’re missing out. It’s a great product. Think of it as an administrator’s Swiss Army knife. And now think of being able to easily snap new tools into that knife, have them work with each other, and customize them to your liking. Fantastic. The most recent release raises the bar even higher. Sometime back, they added a very nice standalone (and integrated) script editor. Now that editor includes a debugger. Set breakpoints. Inspect variables. Step through the script. And it’s free. If you do any PowerShell scripting at all and you haven’t tried this out, go get it now. This entry was posted in Uncategorized and tagged powershell powergui script debug on November 29, 2007 by Antonio Dias. Beta 1 of FullArmor Workflow Studio 1.1 includes support for our PowerShell cmdlets. Workflow Studio lets you combine PowerShell automation with the power of workflows. Those of you who saw FullArmor’s Danny Kim demo the integration during our VMworld talk know just how powerful this is. Sorry, you can’t actually see the demo in the PPT but you can see Danny demo a different application of the same product. FullArmor’s done a nice job – PowerShell and workflow really is like combining chocolate and peanut butter. It’s compelling enough that even before this beta of version 1.1 with specific support for VMware integration, some users were figuring it out on their own. Note that you need to get an early access copy of our cmdlets before you can use them with Workflow Studio 1.1. 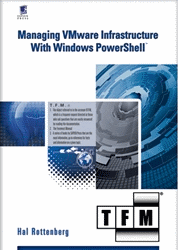 This entry was posted in Uncategorized and tagged powershell script vmware workflow fullarmor on November 29, 2007 by Antonio Dias.